well lacquer dries by evaporation so it gets harder as it dries there is no hardener which i didnt want to use because of the isocyaniates (sp? 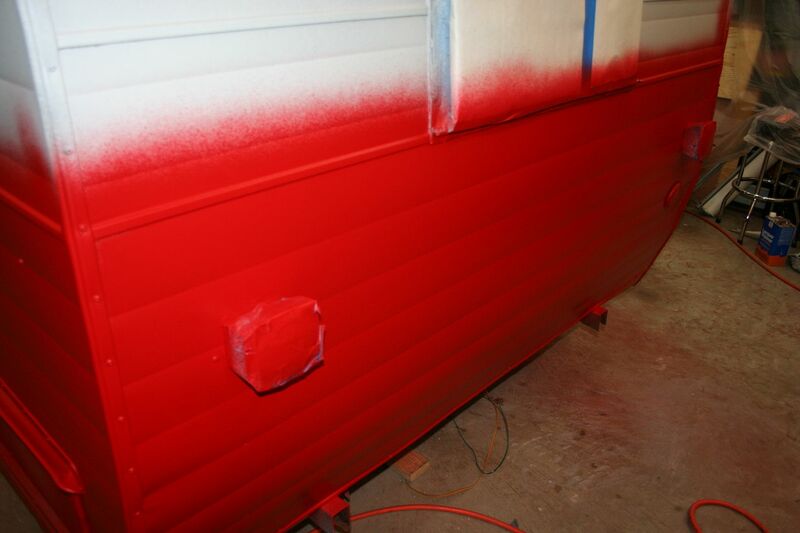 ), after 36 hours the clear coat can be wet sanded and buffed. honestly it doesnt need it for this application. maybe for a car where you want a high gloss finish but for this application the additioanl benefit of the extra clear coats that would be sacrificed for the high gloss i dont think would be worth it. i am really impressed with this product. this is the 6th vehicle i have painted over the decades and the first with the HVLP, i am considering this product for the vette and being able to "right size" the quanitity and return the extra product you dont need is a benefit. Last edited by bobs77vet; 10-04-2011 at 01:53 AM.. Boy that thing looks familiar to me!! Does it have pipe bunks in the rear above the main bed? Did it not have insulation originally or are you upgrading? i dont know what pipe bunks are and i am not sure what my son ripped originally for insulation but this seemed like a good choice on my sons wallet.
. this is the 6th vehicle i have painted over the decades and the first with the HVLP, . sounds like you really like the HVLP gun - i assume you din't have much overspray ? Nice! I used to live near Elkhart, RV Capital of the World. Never heard of a company called Franklin but RV companies come and go pretty quickly. I had a 35' Franklin pull behind I lived in while I was in Atlanta, then hauled it to Detroit for a year. Traded it in on a 36' Travel Supreme. That Frnaklin was really not a bad trailer, but it was for sure NOT designed for either living in year round OR cold weather. there was a guy at work in DC who lived on his boat his family didnt relocate with him...in the winter he stayed at work really late and watched TV in his office. i guess the boat was too damn cold...he showered at work also.